Months-long stalemate over the political entry of actor Chiranjeevi officially concluded this afternoon. As scheduled, Chiranjeevi addressed media conference at 2.45 PM at his newly constructed Party office at Road No. 46, Jubilee Hills, Hyderabad. 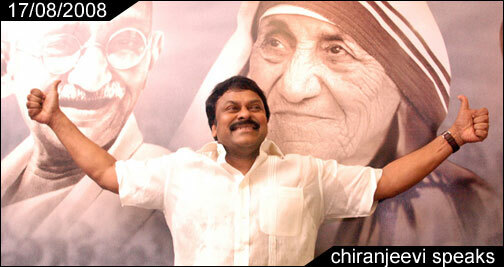 Clad in white dress, Chiru posed for media photographs for a brief while, minutes before addressing the media. Marking this occasion, there was huge fanfare outside the office. 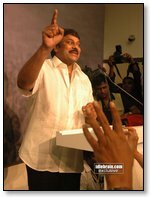 The fans blasted crackers and shouted slogans, "Future CM, Chiru. Chiru… Zindabad." 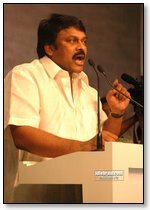 A cool and calm looking Chiranjeevi said: "My sincere thanks to one and all whoever prompted me to enter into politics. It is in tune with the dreams and aspirations of crores of Telugu people, fans and supporters. For the last some months, newspapers replete about my political entry. I consider this as response from the public. Today is the most memorable day in my life. I wanted to talk about my political entry with my own mouth. Today has brought the much required change in my life. For the last thirty years, I was in the film industry. Now, the public response wants me to come into politics. They have decided my political future. Manasa Vachaa Karmana… my life is dedicated to the people and in their service. This is a God-given opportunity. As and when required, God sometimes takes on the human course of action for solving social problems. My political entry is the call from God. People from all over the state and my fans conducted huge rallies and meets inviting me to join politics. Now, it is my basic responsibility and duty to fulfill their dreams." "During all these days, I met a number of socially elite people, common people and several segments of the society. I expressed my feelings to them. One such person who inspired me most is APJ Abdul Kalam garu. He told me: Chiranjeevi, when I was in Chandigarh participating in a program for about 400 students, I asked them several questions. Most of them responded to take up the positions as engineers, lawyers, doctors, civil servants, but a negligible percentage of them (just four or five persons) said they are interested in politics. Politics has come to be regarded as a mire of mud. This should change. People like you should come to change this. You don't know about yourself. You are more than an actor – These words forced me to change my mindset and concentrate on doing something constructive to the people through politics." "There is nothing in finding fault with selfish politicians. When the youth and those who have the stamina to change the society don't respond to politics, it is a big mistake. If I fail to make my decision to enter politics, I shall be making a historical blunder. I thank Abdul Kalam garu for his inspiring words. Another great man who changed the course of politics with social creativity in the state was late NT Rama Rao garu. He proved that artistes also have political and social awareness. I bow my head to him and thank him for all the inspiration to me." "I can clearly see the invitation from lawyers, workers, mahilas, youth, tribal people and all. (Showing the portraits of Ambedkar, Gandhi, Mother Teresa and Pule)… These are the four great people who inspired me. I will tell you two particular incidents which moved me to tears. In Khammam district, a home guard before committing suicide made it clear in his note that he felt sad for not being able to see "Chiranjeevi" as chief minister. Secondly, a couple from the IT sector also did the same thing, before ending their lives. I understand their feelings before resorting to extreme step. Once again, these incidents made me believe that I would be making a historical blunder if I don't enter into politics." I can't act as politician, but only live "I am not here for power or posts. I am into politics just to have mental satisfaction. God has given me popularity and money to some extent. Whenever the people are benefited with my blood bank, they come to me – hold my hands and cheeks, and express their thanks. That is enough for me. After my three decades of stint as an actor, now I am getting ready to do the role of a politician. I can never be acting in this area. Just I have live in this. I shall continue to live with honesty as long as I live." "With regard to the Party's name, agenda and flag, I shall be declaring these matters at a public meeting on August 26th at Tirupati. This day happens to be the birthday of Mother Teresa. 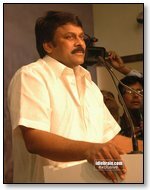 My sole aim is to make Andhra Pradesh into – Santosha Andhra Pradesh and Chiru Navvula Andhra Pradesh."